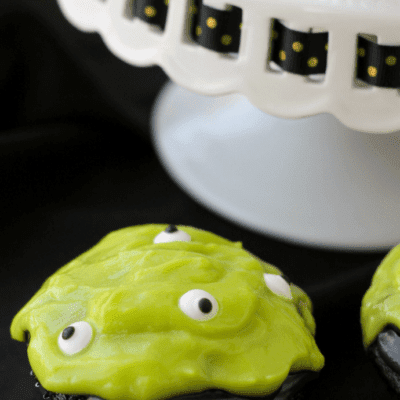 Add some ooze to your Halloween table this year with easy Slime Monster Cupcakes! 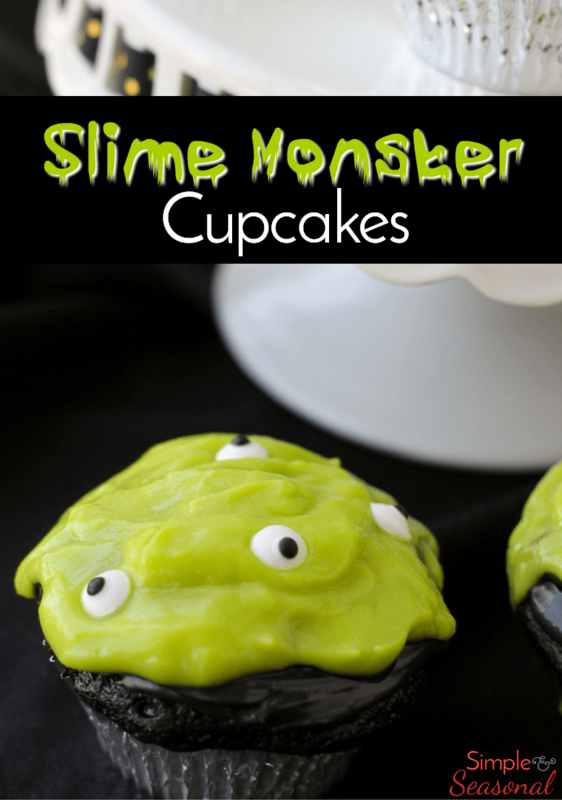 They are slime-filled for a delicious gooey bite! 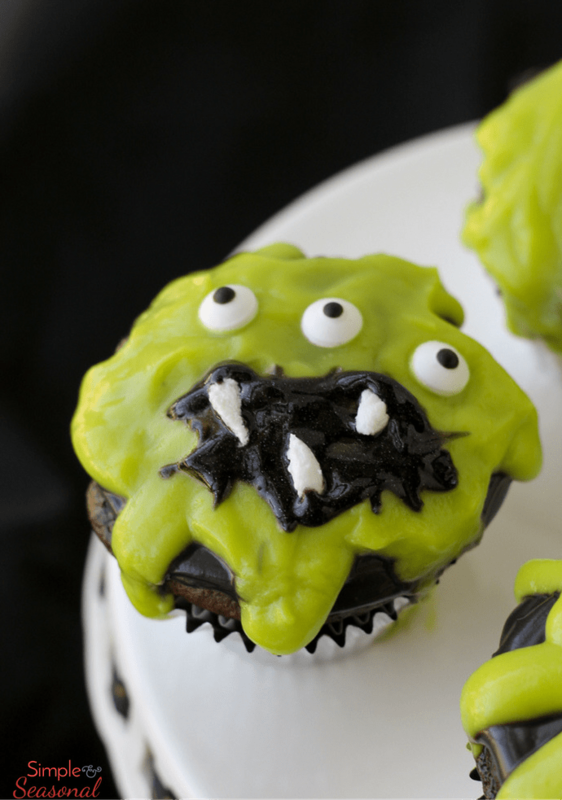 I created Slime Monster Cupcakes for two reasons: first, I want to beef up my holiday content now that I’ve re-branded to simple and seasonal. The second reason is because I’m participating in a Halloween Series again this year with Cupcake Diaries. Last year I made Cake Ball Pumpkins and this year I decided to something a little more fun for the series. Be sure to scroll all the way down to see the other posts in the series! 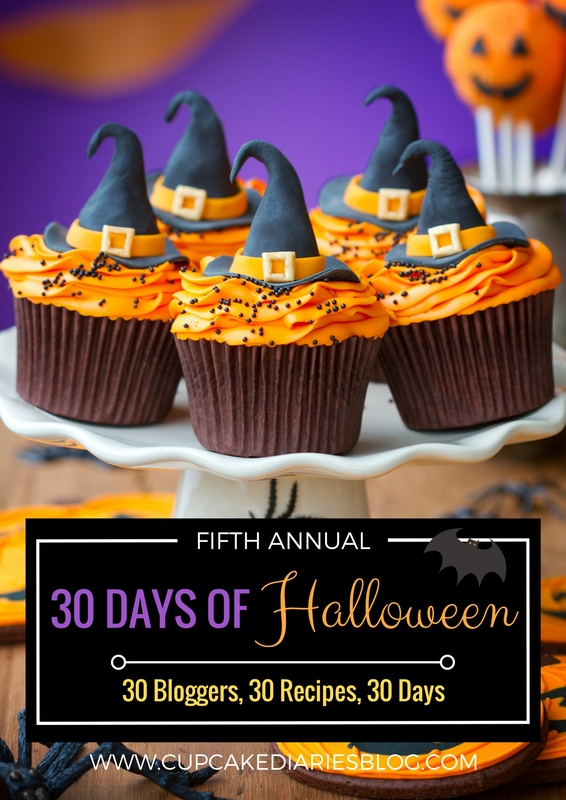 Even though these cupcakes are meant to be part of a Halloween series, I purposely created something that would be useful all throughout the year. 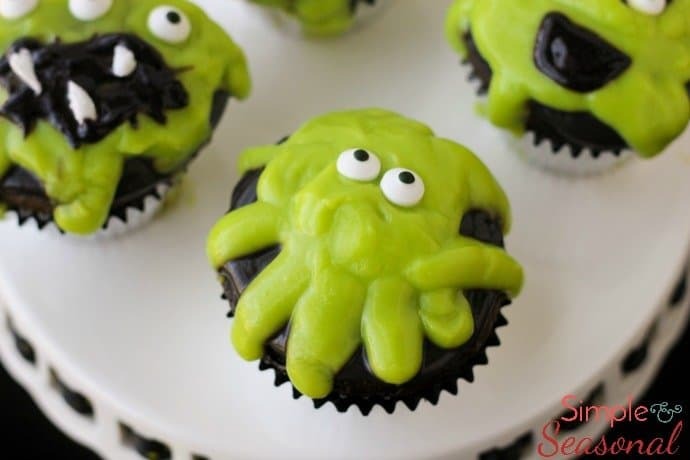 They would be perfect for a Monster themed birthday party. Slime was such a popular thing to make this year (my boys went through LOADS of glue) that the idea of edible slime is intriguing and fun. My six year old would love a slime themed party! 🙂 Whatever you use them for, I can guarantee that they will taste great and be a hit at any party! Make the cake batter according to package directions. Stir in 5-10 drops of black food coloring to darken the cake even more. Pour into cupcake pans lined with paper liners and bake. 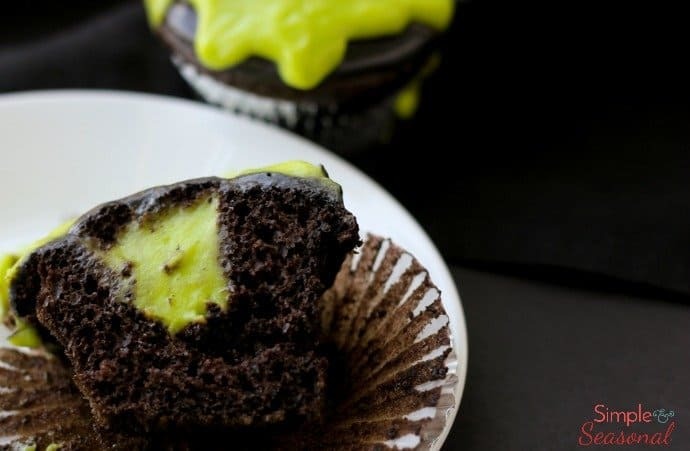 While the cupcakes cool completely, add color to the frosting until you've reached your desired shade of black. Set aside for a moment. In a bowl, add the milk to the vanilla pudding mix as directed. Stir in the green food coloring. Refrigerate for 5 minutes to set. Once the cupcakes are cool, cut a small cone out of each one (see more on how to do that here) and spoon in some pudding "slime." Cover back up with the top off the cupcake cone. Frost all the cupcakes with black frosting. Over a tray to catch spills (I used my cooling rack over a baking sheet, the same way I would for pouring ganache) pipe or spoon the slime pudding over the top of each cupcake. Feel free to get creative here! Pipe into lines to create tentacles, spoon near the edges to let it ooze down the sides, or pile it up in the center. Add candy eyeballs, pipe on faces with black decorating gel, or cut marshmallows to make teeth! Keep refrigerated until time to serve! Make some slime of your own (the non-edible kind) to decorate the Halloween table! If you slightly overfill a jar with it, you can get those great oozing sides. It kind of looks like a bubbling cauldron! 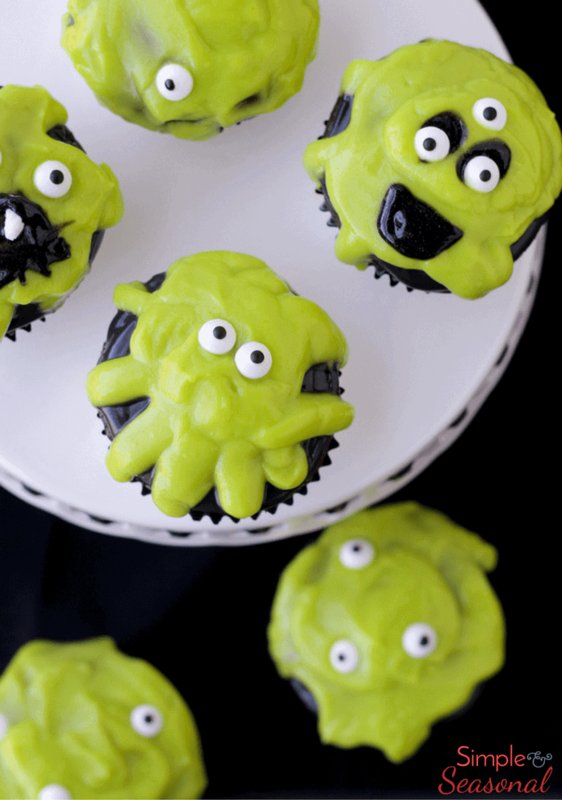 It’s the perfect pairing with Slime Monster Cupcakes! 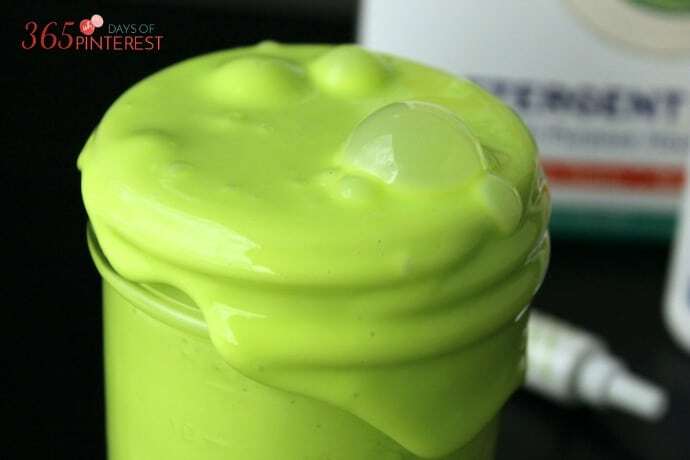 See how to make slime here. These are awesome! I know my boys would love them year round! These cupcakes are such a hoot! They’re so perfect for Halloween. Thanks so much for the great recipe and for participating in the series this year!